Every last friday of the month, I jump on the 'Merry go round'. What is the Merry go round exactly? Each month, a group of craftswomen from around the world join together and give their reponses to the same question/challenge. I promised to show you the finished piece of the picture challenge last month but I didn't like how it turned out. As soon as I filled the holes around the bubbles to cast it, it looked more like a bunch of grapes then like what I had in mind. So I decided not to waste any time casting it. So far for a failed experiment. Aah, don't we all have those? 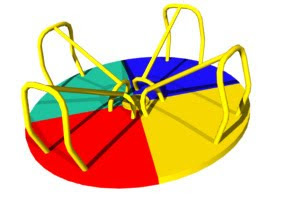 I better move on to this months merry-go-round question: what's your favorite color and how it comes into your work? My favorite color is probably not a surprise for you: lime green. Lime plays a big role in my branding. I used to have a red avatar on Etsy but I had been told it looked a lot like Target's, a shop we don't have in Belgium so I had to check it out. And indeed, it resembles a bit so I decided to change the color as I didn't want to change the shape. I remember I doubted to choose between lime green and teal blue as I love both a lot. But lime won because it's so fresh, vivid and fun! Since then, I bring the color into my packaging with adding lime ribbons or using lime boxes. I add lime happy girls to every order, unless I know it's a repeat order, then I add a different color. I have been told that people can easily recognise me out of a whole lot of avatars in for example an Etsy chatroom as the color and look of it is consistent.